(PhysOrg.com) -- Late last year, astronomers noticed an asteroid named Scheila had unexpectedly brightened, and it was sporting short-lived plumes. 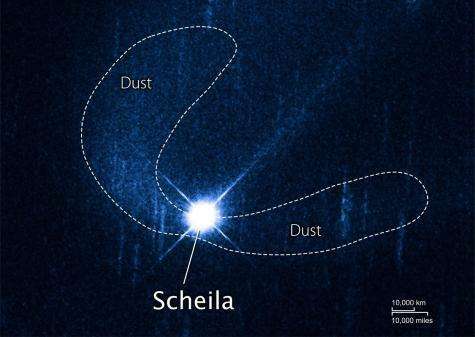 Data from NASA's Swift satellite and Hubble Space Telescope showed these changes likely occurred after Scheila was struck by a much smaller asteroid. 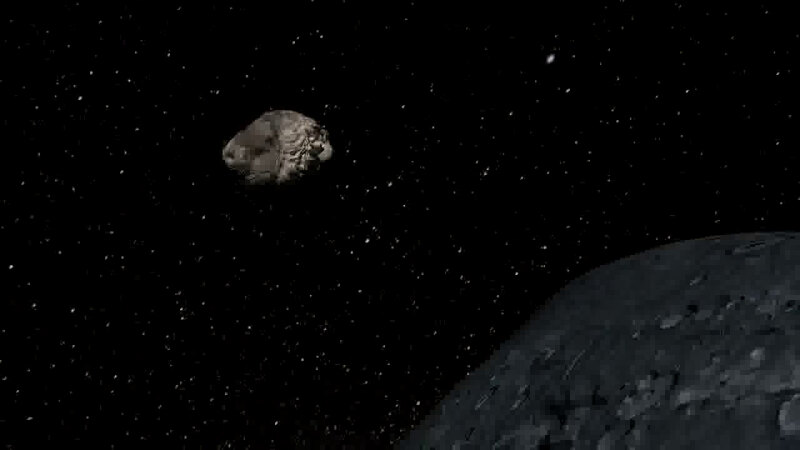 Short narrated video about the asteroid collision. 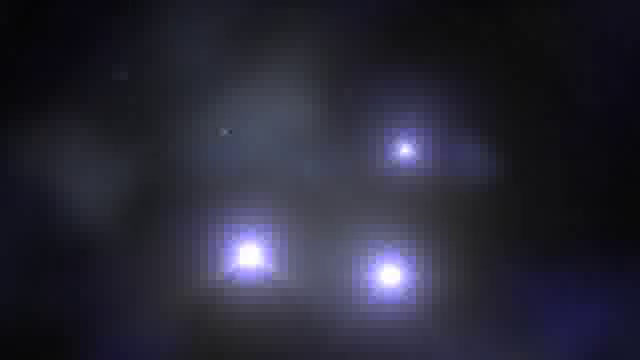 Animation of (596) Scheila collision and dust plumes. Includes some sound effects. So if this impact is comparable to a small 100 kiloton nuke, I wonder what sort of damage a larger nuke would do. Like the "full" version of the Tsar Bomba (100 megatons). I think we have right now the capability to defend this planet from asteroids. We could quite possibly destroy an impending asteroid, or (more likely) divert it enough to miss Earth, however we'd have to detect it first. There in lies most of the actual danger, it will be a while before we have eyes over 100% of the sky at all times. I like that the collision video has the "Includes some sound effects." Because in space there isn't a medium for sound waves to propagate through! And in a effectively way. there's also the fact that we can only see something in space if the sun is barbecuing it. Supposedly critters like Scheila bumping into each other's how planets're formed. 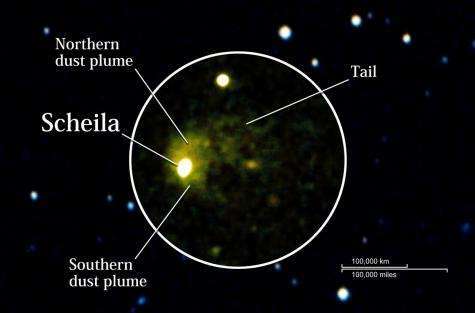 You won't make any planets, going by these standards, but you will make plenty of dust - maybe the 'solar dust disk leads to planetary formation' model's back to front, on this evidence. No it isn't. Collisions are not accretion. Accretion is a resultant effect of electrostatic and gravitational attraction and cohesion, not high speed collision. I didn't not!!! I'm being framed. So, what did show up? I guess that'll be another paper. Almost all of the energy of a nuke is in the form of light. The shockwave you get here on Earth wouldn't happen in space. The effect of a nuke on an asteroid would be to vaporize a small part of the surface. It wouldn't be much really. Remember that it takes a transfer of momentum to change the path of an asteroid, not just energy, but also a component of mass. There's not really much mass in a nuke explosion. All the destructive force you get on Earth comes from the air pressure really. Scorching the side of the asteroid with intense light would have very little effect on its path. In order to change the path you need to blow a piece off or vaporize a large volume of material on one side. A nuke explosion is too brief to vaporize that much material, especially a very very very cold asteroid. Did you know that meteors are cold when they land? The outer surface ablates on entry, but the inside is so cold that it doesn't heat up even when the outside is vaporising. Also, you need to be very precise about how you apply whatever force you can generate on the asteroid. If you aren't carefull you could produce a change in both direction AND speed, which could combine/counteract to still produce a collision path. Or, if you hit it off-axis you might just make it spin rather than change its course much. We will not be able to say that we can properly defend the planet from asteroids within our lifetime, and possibly not in our grandchildren's lifetimes either.